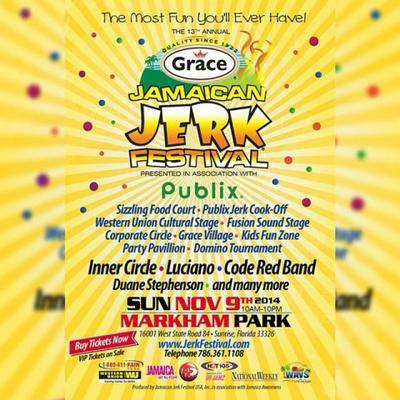 2014 Grace Jamaican Jerk Festival Announces Lineup Inner Circle Luciano Code Red Band Duane Stephenson & Many More Presented by Publix. This year will feature Inner Circle, Luciano, Code Red Band, and Duane Stephenson, with more acts to be added. As always, the Jamaican Jerk Festival is dedicated to giving the community an experience that the entire family can enjoy. Mark your calendar and save the date because this will be "the most fun you'll ever have!"